No celebration is complete if your toys can’t enjoy it too! 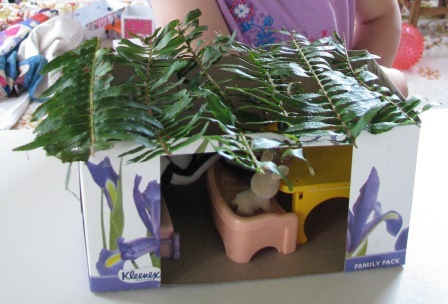 This is the world’s easiest toy sukkah. 1. Cut the top panel off an empty tissue box. 2. Cut a large rectangle from one side to become the doorway. I cut it out completely, then stuck a “beam” across the doorway made from part of the top panel. 3. Collect some small branches or parts of plants from your garden to lay across the roof. 4. Let your toys move in!